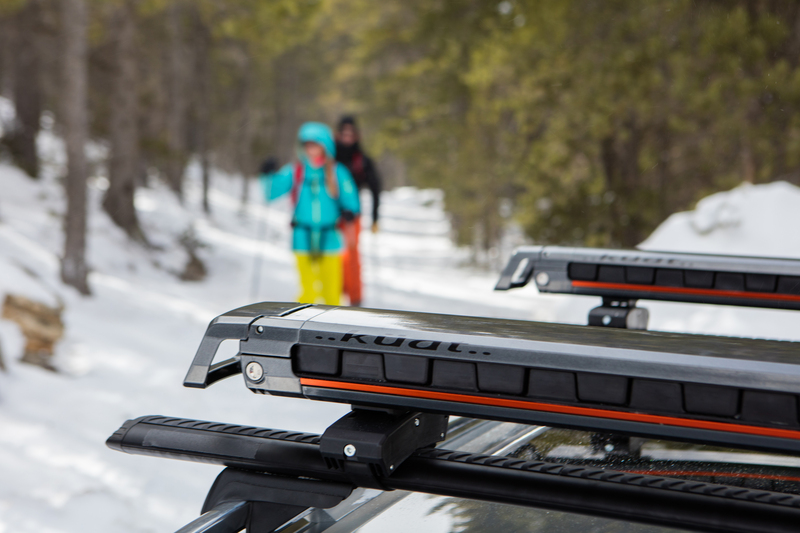 Küat reinvigorates a stagnant category with the GRIP Ski Rack. It makes carrying your skis on your roof easier and more ergonomic — and you’ll be less likely to coat your expensive ski onesie with grime and road salt from your car door. 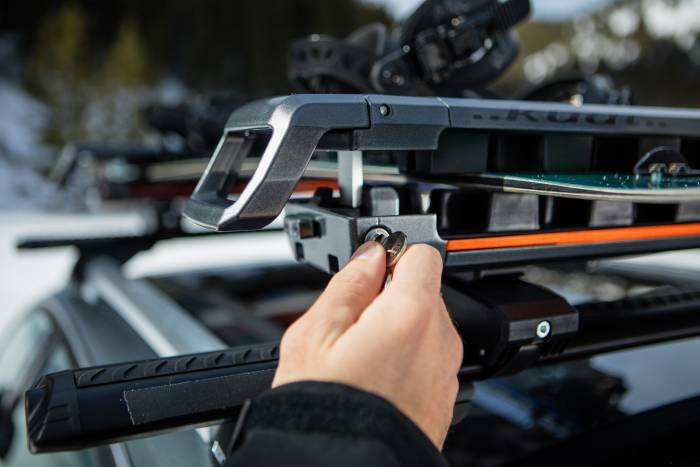 Küat’s new GRIP has beefy lugged rubber to hold your skis or board in place and slides your gear away from the car and closer to you so you can avoid leaning on your car and getting filthy. It grabbed our attention last year to nab a 2018 Best In Show award at the Outdoor Retailer Snow Show. 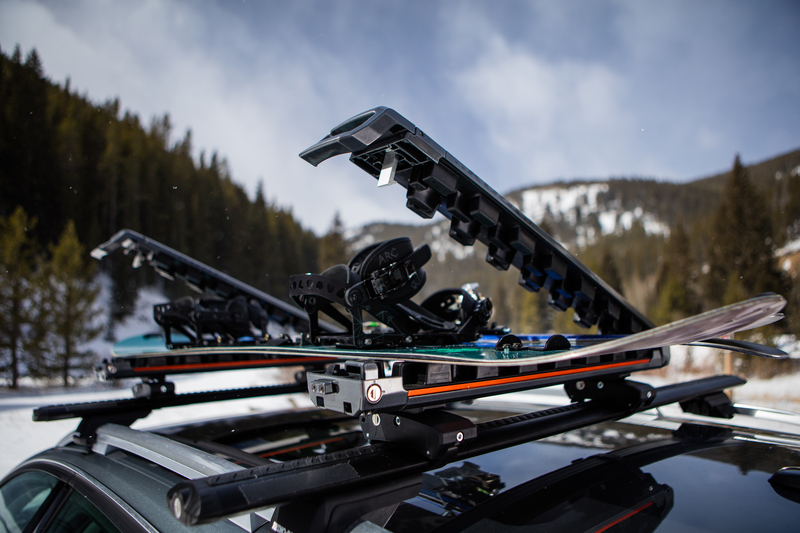 We mounted the smaller GRIP, which holds four pairs of fat skis or two snowboards, on Thule Aeroblade Road bars on a Subaru Crosstrek. It took about 15 minutes, and we used only the tools that Küat provided. Even before they were on a car’s roof, the GRIP racks opened easily via the one-handed lever so we could screw in the bar mounts with the included hex key. With the rack popped open, we screwed in the one closest to the handle. Then, we pulled the tab that releases the sliding rails and extended the racks, which let us install the inside mounts. The GRIP’s mounts attach to roof bars with a strap that slides into a locking mechanism that tightens when it shuts. Using the included hex key, we were able to lengthen the straps to fit over our teardrop-shaped bars. We pushed the mounting lever to lock them down, then tightened a rear hex screw to fine tune their lock onto the bars. With the racks on the roof, we eyeballed them both for levelness and then adjusted the fore and aft tilt with a slightly awkward hex nut on the outside of the rack. With fit and positioning set up, a single key locks the straps onto the bars and locks the rack shut. Then it was time to load skis. With one hand, we grabbed the end handle and squeezed, and the rack popped open. We pressed the release button just inside the end of the rack, and the inside of the rack slid out to around 90 percent of its length. We loaded skis on the soft, grippy, interlocking treads that line the top and bottom of the rack. Then, we slid it in and closed it, and the oversized grippers deformed to hold our boards from sliding around. With skis in there, the rack closed and locked in seconds. An articulated hinge accommodated boards of varying size and bulk. This rack’s mounting system is truly universal and super easy to operate. 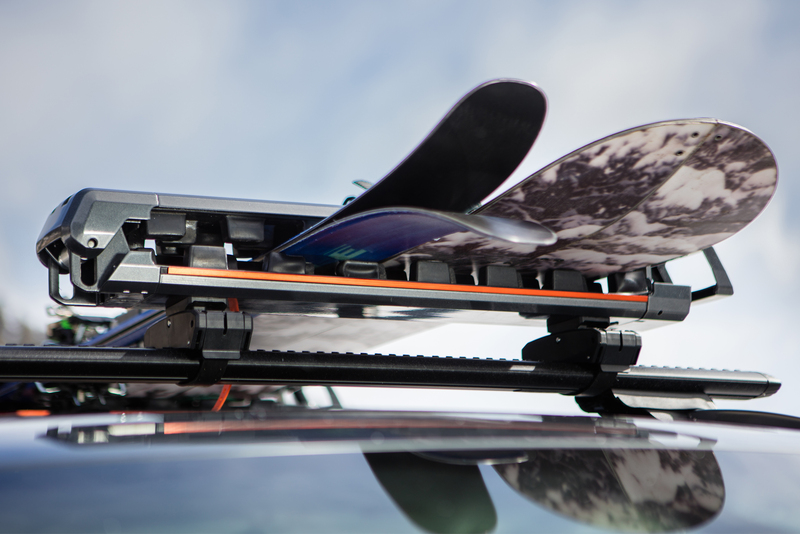 You can load and unload it with one hand operating the rack mechanism, and the other holding your skis or board. It’s seamless, smooth, and secure. I ski primarily in Vermont, and the exterior of my car is disgusting all winter — covered with sandy road grime. This rack helped me keep my kit clean. The Subaru Crosstrek isn’t really spacious enough to put skis inside, especially if you’re transporting skis and multiple passengers or if you like to bring your dogs skiing. So we needed another solution. But roof boxes are expensive. 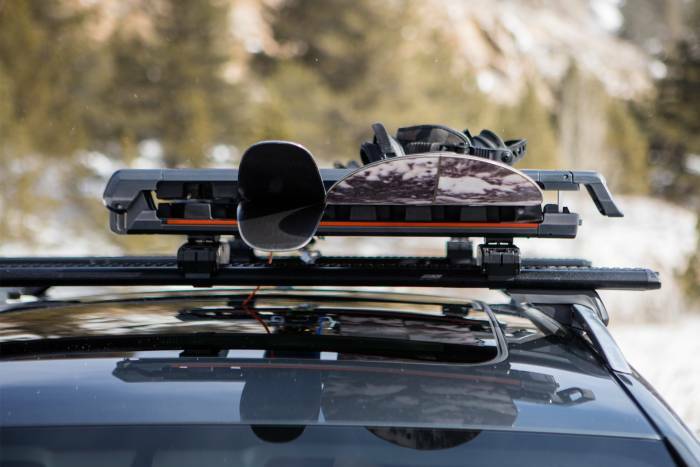 This rack costs $329-389, but Thule’s rooftop boxes long enough for skis cost at least $100 more, and they take up a lot of storage space when you’re not using them. And, if you’re average height or shorter (I am 5’7”), you can’t help but press up against the dirt that coats your car when you load and unload. With a rooftop-mounted rack that extends out from the car as far as this one does, we never got dirty. Any time there are a lot of moving parts, there’s the chance that a piece will freeze in place. We’re sure Küat engineers did their due diligence, but we’re wondering if there’s a chance some of the parts might freeze up when the rack goes from a warm garage to barreling down the highway. Get the GRIP for $329-389 at kuatracks.com.